By Claudia Adrien. Mar 11, 2017. 9:00 AM. Published in 1766, The Vicar of Wakefield by Oliver Goldsmith became one of the most widely read novels of the Victorian era. It is widely referenced in British literature—from Charles Dickens' Tale of Two Cities to Jane Austen's Emma and George Eliot's Middlemarch. A book about family endurance, the drama surrounds the characters of the Primrose family: Dr. Primrose as the Vicar of Wakefield, his wife, and their many children. The Primrose's idyllic country life is turned upside down when they lose their financial footing and a daughter is abducted. The circumstances in which the novel was published were nearly as dramatic as the work itself. Dr. Samuel Johnson was one of Goldsmith's closest friends. One morning, Johnson received a message from Goldsmith asking him to meet the writer at his home. Goldsmith couldn't pay his rent, and his landlady was about to evict him. When Johnson arrived, Goldsmith handed him the completed novel and begged Johnson to quickly secure a publisher. 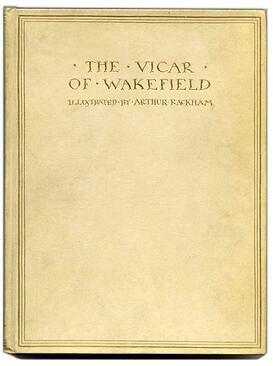 Johnson did just that, selling The Vicar of Wakefield to a bookseller for 60 pounds. Goldsmith used the money to avoid eviction. Goldsmith did not always take credit for his literary works. In the beginning of his writing career, he used the pen name "James Willington," which was the name of old classmate from Trinity. Sometimes he wrote anonymously. Although one of his most famous works, The History of Little Goody Two-Shoes, is attributed to him, he never claimed it as his own. John Newbery published the book in 1765 without providing the name of the author. Goldsmith wrote children's books for Newbery as one means of paying off the gambling debts he frequently incurred. The Vicar's family experiences instability at the novel's start. When the Vicar's son, George, is about to marry the wealthy Arabella Wilmot, the Vicar loses his family's inheritance to a merchant investor who leaves town with the money. As a result, Wilmot's father calls off the wedding, and George also leaves the parish. After the wedding fiasco and family bankruptcy, the remaining Primrose family members move to a more humble parish on land owned by Squire Thornhill. Relocating to the parish seemed to provide the peace and tranquility the Primrose family desired. However, this does not last long. Sophia, the Vicar's daughter, is smitten with Mr. Burchell, a poor man that Sophia's social-climbing mother discourages her daughter from seeing. Olivia, the Vicar's eldest daughter, disappears and the Vicar initially accuses the impoverished Mr. Burchell of abducting her. Rather, it was Mr. Thornhill, the landlord, who had taken Olivia, marrying her in a mock ceremony with plans to leave her thereafter. The calamity does not end with the abduction. The Primrose home catches fire, destroying all of their belongings. And when the Vicar cannot pay the rent to Mr. Thornhill, he is thrown in prison. He is followed there by his son who challenges Mr. Thornhill to a duel. Things become even more surreal when the impoverished Mr. Burchell is in fact not downtrodden but one Sir William Thornhill (not to be confused with the evil landlord), a wealthy nobleman and Squire Thornhill's uncle, who travels the countryside in disguise. This is where things begin to look up for the Primrose family. 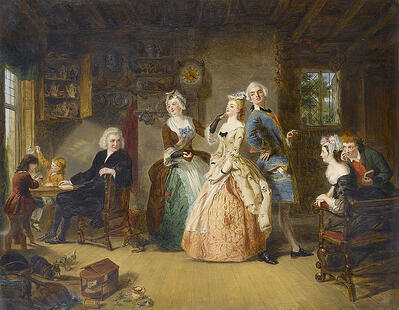 Sir William marries Sophia, and George finally marries Arabella. The Vicar also finds financial security again when the merchant who caused the family's bankruptcy is found and held accountable. As for Olivia, it turns out her sham marriage was in fact legalized, and she is tied to the terrible Squire Thornhill. The Vicar of Wakefield touches on many themes: class, gender, and the strength of family. But religion, or lack therefore in the novel, is also worthy of note. Although Goldsmith's protagonist is part of the clergy, and moral messages run throughout the novel, the Vicar doesn't have a particularly intimate relationship with God. Rather, he uses religion to selfishly advance his family to their determent. Interested in collecting The Vcar of Wakefiled? We'd recommend looking at the edition which includes illustrations from legendary artist Arthur Rackham.